Technocraft Industries (India) Limited (TIIL) reported a net return on capital employed (NRoCE) of 9.86% and return on assets (RoA) of 7.23% during FY17-18, more or less in line with the previous three years, resulting in approximately 30% compounded annual growth rate (CAGR) in the stock since March 2015. Negative global cues along with a worrying macro-economic situation and mixed start to the corporate earnings season subdued key domestic indices on Tuesday. The quarterly results are mixed adding to the negative sentiments among the investors. Selling pressure was witnessed in IT (information technology), healthcare, oil and gas counters. Hero MotoCorp launched the new Destini 125 cc scooter priced between Rs54,650 and Rs57,500. The company’s shares closed at Rs2,738.20, up 0.23% on the NSE. Public sector lender Syndicate Bank has received a capital infusion of Rs728 crore from the Central government. Syndicate Bank’s shares closed at Rs31.30, down 1.26% on the NSE. Software major Infosys jointly unveiled the 4.0 version of Artificial Intelligence (AI) framework for industry, utilities and infrastructure enterprises, with Finland-based consulting and engineering firm Poyry plc. Infosys shares closed at Rs663.05, down 2.49% on the NSE. Bajaj Finance reported Q2 FY19 consolidated results with total revenue of Rs4,255.92 crore (Rs3,050.65 crore in the same period a year ago), up 39.5% year-on-year. Profit after tax was at Rs923.47 crore (Rs597.87 crore in the same period a year ago), up 54.5% year-on-year. Earnings per share were at Rs16.03 (Rs10.80 in the same period a year ago). The company’s shares closed at Rs2,135.00, up 0.93% on the NSE. TVS Motor reported Q2 FY19 standalone results of revenues of Rs4,993.47 crore (Rs4,064.72 crore in the same period a year ago), up 22.8% year-on-year. Profit after tax was at Rs211.31 crore (Rs213.16 crore in the same period a year ago), down 0.9% year-on-year. Earnings per share were Rs4.45 (Rs4.49 in the same period a year ago). Interim dividend of Rs2.10 per share was declared. The company’s shares closed at Rs539.90, up 4.57% on the NSE. Welspun India reported Q2FY19 consolidated results with total income at Rs1,797.8 crore (Rs1,629.9 crore in the same period a year ago), up 10.3% year-on-year. Profit after tax was at Rs114.8 crore (Rs96.6 crore in the same period a year ago), up 18.8% year-on-year. Earnings per share were at Rs1.14 (Rs0.96 in the same period a year ago). Earnings before interest, tax, depreciation and amortisation (EBITDA) were at Rs307.3 crore (Rs306.3 crore in the same period a year ago), up 0.3% year-on-year. Margin was at 17.1% (18.8% in the same period a year ago). The company’s shares closed at Rs58.25, down 2.84% on the NSE. Asian Paints reported Q2 FY19 consolidated results with revenues at Rs4,639.05 crore (Rs4,274.18 crore in the same period a year ago), up 8.5% year-on-year. Net profit was at Rs492.76 crore (Rs575.89 crore in the same period a year ago), down 14.4% year-on-year. Earnings per share were at Rs5.14 (Rs5.30 in the same period a year ago). Interim dividend of Rs2.85 per equity share was declared. The company’s shares closed at Rs1,142.45, down 4.83% on the NSE. 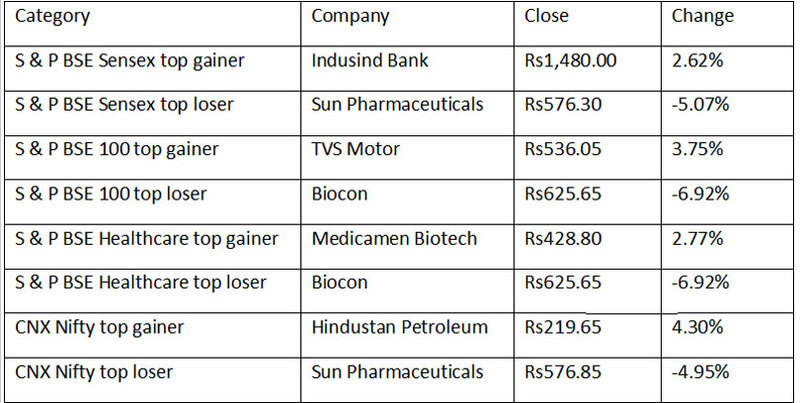 The key Indian equity indices managed to trade in the green initially. However, as the trading session progressed, the market correction set in and the major indices closed with losses. Lending major HDFC Bank reported a 20.6% increase in its net profit to Rs5,005.73 crore during the quarter ended September 30, 2018, as compared to Rs4,151.03 crore in the year-ago period. The Bank's total income for the quarter under review was at Rs28,215.2 crore, up by 21.2% from Rs23,276.2 crore for the corresponding period last year. According to the lender, net interest income (interest earned less interest expended) for the period grew by 20.6% to Rs11,763.4 crore, from Rs9,752.1 crore for the year-ago quarter, driven by asset growth and a net interest margin for the quarter of 4.3%. HDFC Bank shares closed at Rs1,993.00, up 1.38% on the BSE. Lupin has received approval for its Triamcinolone Acetonide Ointment USP, from the US FDA (Food and Drug Administration) to market a generic version of Mylan Pharma's Triamcinolone Acetonide Ointment. It is an anti-inflammatory ointment. Lupin shares closed at Rs883.35, up 0.35% on the NSE. NBCC bagged two orders worth Rs1,376.53 crore for Redevelopment of Ayur Vigyan Nagar Campus of AIIMS (All India Institute of Medical Sciences) at New Delhi, Pkg.-I/Phase I (Order value: Rs837.77 crore) and Redevelopment of Charbagh, Lucknow Railway Station and adjoining Land Parcels (Order value: Rs538.76 crore). NBCC India shares closed at Rs53.30, up 0.95% on the BSE. Gayatri Projects bagged three new orders worth Rs403.96 crore from Bihar State Road Development Corporation Limited (BSRDC). The company’s shares closed at Rs165.00, down 2.86% on the BSE. Alembic Pharma has successfully cleared its first US FDA inspection of its new formulation manufacturing facility located at Karakhadi, Gujarat with zero observations. The company’s shares closed at Rs580.05, down 4.61% on the BSE. Tejas networks has received a purchase order of Rs111 crore from Sterlite Technologies for Indian Navy’s country wide next generation digital communications network. Tejas would be supplying terabit capacity DWDM systems and high performance Layer-3 Multi Gigabit Ethernet switches. The company’s shares closed at Rs267.80, down 2.81% on the BSE. Kansai Nerolac reported Q2 FY19 standalone results with net sales at Rs1,414.87 crore (Rs1,287.89 in the same period a year ago), up 9.9% year-on-year. Profit after tax was at Rs121.99 crore (Rs144.63 crore in the same period a year ago), down15.7% year-on-year. Earnings per share were at Rs2.26 (Rs2.68 in the same period a year ago). Glaxosmithkline Pharma reported Q2 FY19 standalone results with revenues at Rs816.31 crore (Rs836.26 crore in the same period a year ago), down 2.4% year-on-year. Profit after tax was at Rs100.77 crore (Rs130.32 crore in the same period a year ago), down 22.7% year-on-year. Earnings per share were at Rs5.95 (Rs7.69 in the same period a year ago). Jubilant Life Sciences reported Q2 FY19 consolidated results with total revenues of Rs2,269.49 crore (Rs1,642.04 crore in the same period a year ago), up 38.2% year-on-year. Net Profit was at Rs210.41 crore (Rs128.26 crore), up 64% year-on-year. Earnings per share were at Rs13.50 (Rs8.29 in the same period a year ago).